This was okay but I prefer traditional hummus. My kids liked this but my husband complained about the texture (not a smooth as chickpea-based hummus) and that it tasted a bit "funny." This is really easy and yummy! I highly recommend it if you have kids, as they love the peanut curry sauce. I didn't add hot peppers but the adults used sriracha at the end. I didn't have peanuts so I topped it with cashews instead. We served it with brown rice. I might add tofu next time but I think you could sub any veg in here and it would be great. This was a homey and substantial vegetarian stew. I made it over the weekend and served it a few days later so the flavors really had time to come together. I made the dumplings the day of serving. I didn't have much luck with their texture- I think the problem was that I planned to sub shortening for the suet but didn't realize until too late that I didn't have enough shortening. So I had to use half butter and half shortening, which made for a pretty stodgy dumpling. The flavor was on point however. This has lovely flavors. In particular, I really liked the pear and coconut combination. I baked about 20 minutes longer than specified since I was suspicious as to whether the middle was cooked through, and with all of the fruit, I didn't think it would be dry. (It wasn't.) I didn't think the nibbed sugar on top was necessary- I used it but the texture blended into the cake (from the juice from the fruit). This was delicious. The batter was very thick and dry. I had a hard time spreading it, or folding the fruit in. I was tempted to add some milk but I ended up adding some melted coconut oil to lubricate the batter. It ended up fine. The texture was good and the taste was lovely. We ate it with fresh whipped cream. This was delicious. I especially enjoyed the little nubbins of apple dotting the cake. This was an easy and pretty tasty dinner, after some tweaking. Chicken breasts go in a fairly simple marinade for up to two hours before grilling. I had a marinade of about that time and the flavor was really good. (Lime juice is called for in the marinade recipe, but the instructions omit any further reference. I just added it to the marinade with the rest of the ingredients.) The peaches were reminiscent of mango in the salsa, and I would consider peaches as subs for mangoes in other salsa/salad recipes when peaches are abundant. I did add a green chile to the salsa, and I'm glad that I did because the cayenne in the marinade added negligible heat. This was inedible. Nobody ate more than a bite of it. It may be my fault, not the recipe's. I didn't have gelatin sheets so I used powder. I looked up substitution guidelines and followed them carefully but the end result was so rubbery we could hardly chew it. The flavor was also off. I like orange blossom but because it was in the panna cotta and the strawberries, the end result was a cloying, disgusting mess. I usually love Ruby's recipes so I'm assuming the fault is more with my execution than with Ruby's recipe writing but I'm not willing to try this again. . . These were very tasty. I served them alongside the chorizo burgers from Dinner so omitted the sausage meat and added a little goats cheese instead. I loved the almond addition, that gave a little crunch. We enjoyed this but the recipe was a bit fussy and I didn't like it as much as the coconut fish curry in Made In India (which is also easier to make). This was a complete disaster. There wasn't enough water and when I took the lid off, the rice was still crispy. I added more water and cooked it some more but even after the rice cooked, the flavors were muddy and the dish was very unappealing. These muffins are a subtle pleasure. They don't hit you over the head with dramatic flavor but the seeds and honey butter combine to make a satisfying combination. I found myself liking them more and more as I ate. I will definitely make these again, especially because I always have the ingredients on hand. My kids especially loved the honey butter. This was good but not as special as most of Ruby's recipes. I used sunflower oil instead of almond oil so perhaps that would have resulted in a more interesting flavor? I used the proportions in the Guardian version- the book version uses slightly more flour, sugar, and almond oil. Not sure how that will impact the results. But this is a delicious cake that is perfect for breakfast. The crust on the cake is particularly nice. I did use the almond oil- I honestly don't know if it makes a difference or not. I detected the aroma in the batter, but less so in the final product. I needed five minutes more than specified, but I did use frozen blueberries. The baking section of this book is, perhaps predictably, the strongest. I made her lemon, buttermilk and black pepper cake, and it may be one of the most impressive cake recipes of the year. 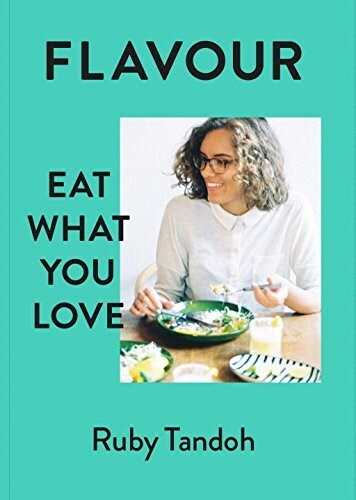 Ruby Tandoh’s new book brings us over 170 recipes – sweet and savoury – for every day, every budget, every taste, in a cookbook that puts your appetite first. Ruby encourages us to look at the best ways to cook each ingredient; when it’s in season, and which flavours pair well with it. With this thoughtful approach, every ingredient has space to shine; storecupboard staples inspire as much attention as a cut of meat and a sprig of thyme takes centre stage baked into soft teatime cakes. These are recipes that feel good to make, eat and share, and each plate of food is assembled with care and balance.